Last month we were in Pueblo for a family reunion. Hadn't been there for decades and my cousin suggested we visit the Riverwalk. It was an excellent suggestion and we greatly enjoyed our time at the river's edge. 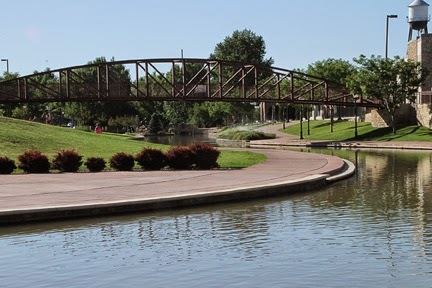 The Arkansas River flows gently by wide, curving sidewalks which are enchanged with beautiful flowers and unique sculptures. The sidewalk takes you about a mile but there are bridges to cross for shortcuts. It was a lovely way to start a Saturday.